I know. I must have some kind of chili obsession going this week. But there’s a reason for it, and then I will just get off the subject. As you well know, Episcopalian women are devoted to providing food to themselves and others. Particularly others in a time of need. Funeral food? We are the unequivocal masters of funeral food. Having a baby? We’ve got you covered. Just home from a medical procedure? We’re practically there before you pull in the driveway, ringing the doorbell with a casserole. So St. Paul’s Episcopal Church has discovered the greatest web-based application ever to enhance our ability to show up on your doorstep with comfort food. It’s called Meal Baby and the whole idea is that you can coordinate with others of your ilk in providing meals that don’t conflict with each other. You pick a day and a menu. You can also click on other days already taken and see what someone else is bringing. There’s a section for likes and dislikes and any allergies the recipient might have. It is the 21st century version of a phone tree. So, one of our parishioners had a heart attack. He’s home now but his family needs meals for a few weeks. As any good Episcopal woman would, I jump on Meal Baby and see what’s already on his plate. Good stuff. Pot roast with potatoes and carrots. Pork tenderloin with acorn squash. Turkey gumbo with rice. So I decide on chili. Who doesn’t like a good pot of chili? Since we have already consumed all the Texas chili from a few nights ago, I turn to my old standby. It is not too shabby, if I do say so myself. My chili follows Mark’s “two” rule. Two pounds of ground chuck and two cans of beans, diced tomatoes and tomato sauce. 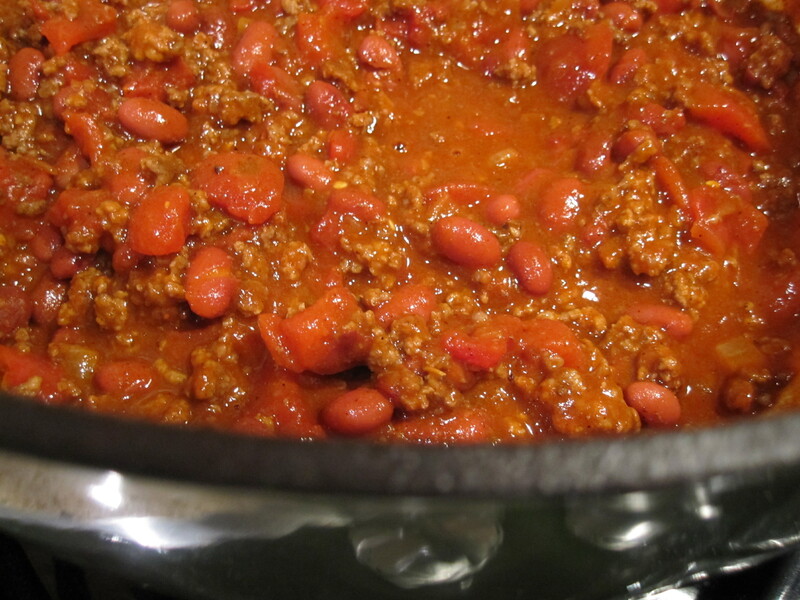 However, I have amended the rule with a few other enhancements that I believe elevates my chili above his. I say this modestly, of course. One of my secrets is Asian chili garlic sauce. You can find it many times in the Asian section of your grocery store. If you use a lot of the stuff it will blow your head clean off. But if you use a modest amount, it will provide a subtle spiciness that even the most timid spice hater will embrace. And then there’s bacon. Who in the world would not love a little porky love in their chili? Nobody I know. Brown ground beef well (until there are some browned bits in the pan). Remove and reserve. Fry bacon until golden. Remove from the pan. Add onions and sauté in the bacon grease until soft and beginning to brown. Add ground beef, bacon and onions to a large pot. Add chili seasoning and stir to combine, cooking over medium heat for about a minute. Add red beans, diced tomatoes, tomato sauce, salt, smoked paprika and chili garlic sauce. Mix well and simmer, stirring occasionally for an hour. It’s just a little bit of bacon. :) And I sent some clementines, too, so does that get me off the hook just a bit? Sorry my first post (ever) on your site was a bit negative – especially considering all of the good ideas/recipes I’ve gotten from here. But I really didn’t think you actually read the comments so I haven’t bothered with adding my two cents before. Now that I know you actually read them, I promise to post with some good stuff in the future. I’m sure the kindness and generous spirit of the cook cancelled out any bad stuff! Have a great day! I get an e-mail alert every time there’s a comment so I read all of them! No worries. The patient’s allergic to dairy, red wine and chocolate so I figured he needed a little something to indulge in!